Program leaders at the Sunset Neighborhood Beacon Center (San Francisco, CA) learned early on that if they were going to successfully enlist the ongoing participation of their middle school youth, the program activities needed to be active, project-based, socially centered, and meaningful to the youth. They also knew that they needed to use "education speak" in communicating the value of their program to the administration and teachers of A.P. Giannini Middle School. 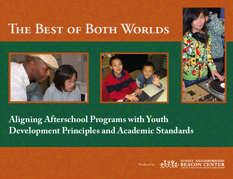 Their learnings were beautifully captured in their publication, The Best of Both Worlds: Aligning Afterschool Programs with Youth Development Principles and Academic Standards. This program toolkit outlines lesson plans from seven of their most popular project-based learning clubs, complete with a listing of the academic standards that each club addresses. It also provides planning templates to help others design their afterschool activities. While they are not referenced specifically, one can see how the Learning in Afterschool learning principles are artfully applied within this program. We highly recommend that you check out this publication. Staff training on how to design standards-based clubs are also available.